Shams made in the USA, by Professional Craftsmen, with World Class Workmanship, and the Latest Styling. Each is masterfully stitched and pattern matched by experienced craftsmen. Our Pillow Shams feature a common thread. It's called Craftsmanship. As a designer, it's important for you to work with people you can trust implicitly. Professionals who listen to your ideas, then transform your fabrics into exquisitely finished pieces. At The Quilting House, we offer the very best in custom Pillow Shams. With so many available choices, it's easy to let your imagination run wild. Pillow Shams can be as simple or as extravagant as your imagination. No matter which look you are trying to achieve, layer several sizes for that inviting, comfortable look. For example, a Queen size bed looks great with the following: two European shams in back followed by two Queen shams and several throw pillows in front. Shams are covers for bed pillows, or bed sized pillows, Euro, King, Queen, Standard Full size. Faces are pattern matched and centered. The standard option is made with envelope backs. 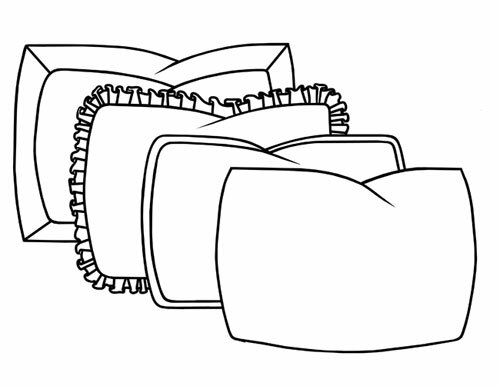 Although this simple overlap on the back for pillow insertion is standard, a zipper is also a convenient option. Your shams are then reversible. Another simple option, your shams can be filled and machine closed. A coordinating fabric can be used on the back if desired. The basic style is knife edge, to that you may add, welting, ¼”, ½”, 1”, rope, fringe, or gimp trim. Ruffled, single or double rows. Ruffles are shirred to 300% fullness and are Self Lined. Flanged, filled or unfilled, with mitered corners. (Non mitered corners are only available if there is no welt or fringe between the base and the flange.) Banding or Shirred Banding are also options. The fronts may be quilted to match the bed cover, or a pattern of your choice. Custom styles and sizes are available. You can design your own custom sham, and we will provide you with a quote for the yardage & cost to fabricate. Width and height dimensions are from seam to seam, not including flange, ruffle, welt, etc. While some manufactures don’t bother with such painstaking measures, we believe small details make a big difference.